Abstract form assembled from a bent steel strip, with a coil of wire extending from one end, and a square steel form emerging from the other. Bent mild steel strip stuffed with Egyptian paste, fired in a sagger of red Kew sand to 1000 deg. C. Other materials include nichrome wire, clinker etc. Although the puff adder cannot fly it has caught the hornbill (Ashanti Proverb), Gillian Lowndes, 1986, Crafts Council Collection: P384. Photo: Todd-White Art Photography. 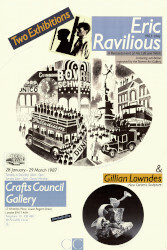 One of the most important pieces in a group of work produced over a year for the Crafts Council solo exhibition in 1987.